Here's a look at the NFL's all-time leading rushers who surpassed the 10,000-yard mark for their career. (Stats updated through the 2018 regular season). Some said he was too small, some said he was too slow. 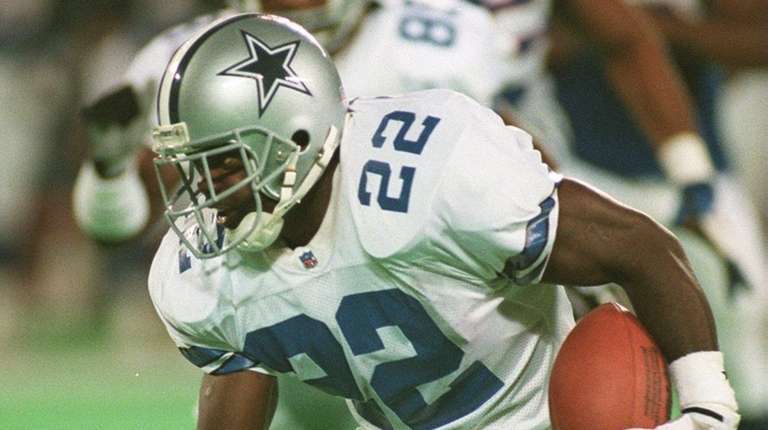 But in the end, Emmitt Smith proved all doubters wrong and became the NFL’s all-time leading rusher. Known for his excellent vision, tremendous leg strength and great balance, Smith helped lead the Dallas Cowboys to three Super Bowl titles in 1992, ‘93 and ‘95. He is the only running back to ever win a Super Bowl championship, the NFL Most Valuable Player award, the NFL rushing crown and the Super Bowl Most Valuable Player award all in the same season (1993). He was inducted into the Pro Football Hall of Fame in 2010. "Sweetness" spent his entire career with the Chicago Bears and is remembered as one of the most prolific running backs in NFL history. He was given his nickname because of the way he easily eluded defenders using a stutter-step. In 1985, Payton helped lead the Bears to a 15-1 record and a Super Bowl title. He was named to the Pro Football Hall of Fame in 1993. After struggling with a rare liver disease for several months, Payton died on Nov. 1, 1999 at 45. Sanders was arguably the most elusive running back ever to play football. His agility and explosiveness, combined with his low center of mass, made him almost impossible to bring down. He spent his entire career with the Detroit Lions. His 2,053 rushing yards in 1998 is third-best in NFL history. In 1999, Sanders shocked the world when he announced his retirement. Several years after refusing to discuss the abruptness of his decision, Sanders finally admitted that it was the losing culture of the Lions organization that drove him away. He was inducted to the Pro Football Hall of Fame in 2004. Gore rushed for at least 1,000 yards per season in eight of his 10 seasons in San Francisco before joining the Colts in 2015. In three seasons in Indianapolis, Gore averaged 984 per season. He's now a member of the Miami Dolphins. After spending three seasons with the New England Patriots, Martin came to the Jets in 1998. 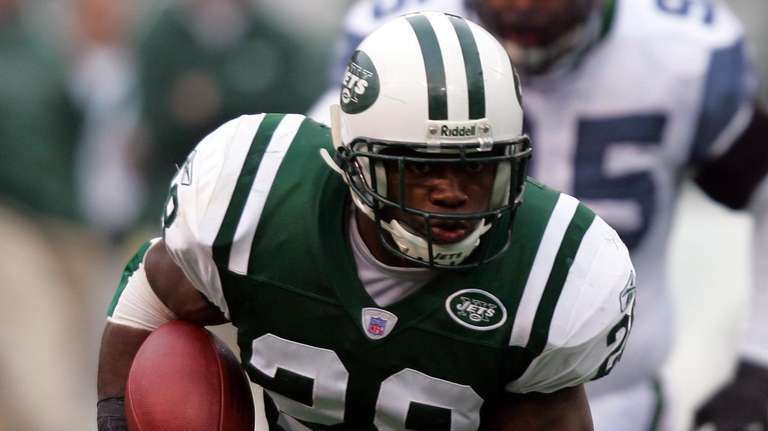 He missed one game in his first seven seasons in New York, and in 2004, at age 31, became the oldest running back to win the NFL rushing title. In 2007, he officially retired after a knee injury forced him to the sidelines for more than a year. He is the Jets' all-time leading rusher. Tomlinson is arguably the best running back of his generation. He spent most of his career with the San Diego Chargers before coming to the Jets in 2010. He rushed for more 1,200 yards and caught more than 50 receptions in each of his first seven seasons in the NFL. In 2006, he set the record for most touchdowns in a season with 31, on his way to winning league MVP. Known as "The Bus," Bettis is considered one of the best big backs of all-time because of his footwork and power. Bettis was selected by the Rams, and played three seasons there before being traded to Pittsburgh during the 1996 draft. Despite losing the role of featured back in the latter part of his career, Bettis remained an integral part of the Steelers’ offense as a short-yardage and goal-line option. In 2006, the Steelers won the Super Bowl in Bettis’ hometown of Detroit, and he officially announced his retirement after the game. Dickerson came into the league in 1983 with the Los Angeles Rams and immediately began an onslaught of the NFL record book. After a record-breaking rookie season, he set the record for rushing yards in a single season with 2,105 — a record that still stands. He also played for the Indianapolis Colts, Los Angeles Raiders and Atlanta Falcons before retiring in 1993. He was inducted into the Pro Football Hall of Fame in 1999. Peterson became the fifth player in NFL history to eclipse 10,000 yards in his first seven seasons in the league. He broke 10,000 yards after picking up 211 rushing yards on 35 carries in the Minnesota Vikings' overtime win over the Chicago Bears on Dec. 1, 2013. He's now a member of the Washington Redskins. Dorsett spent most of his career with the Dallas Cowboys. In his rookie year they won the Super Bowl, making him the first player to win the college football championship one year and the Super Bowl the next. His most productive season came in 1981 when he ran for 1,646 yards. He was traded to the Denver Broncos in 1988 and led them in rushing for one year before injuries forced him to retire in 1989. Dorsett is the only player in history that won the Heisman Trophy,a college national championship,a Super Bowl, , and is in both the College and Pro Football Halls of Fame. Jim Brown is known not only as one of the greatest football players ever, but as one of the greatest athletes ever. A multi-sport athlete in college, he was drafted by the Cleveland Browns in 1956 and left after just nine seasons as the NFL record holder for almost every major rushing statistic. Brown, who grew up in Manhasset, was the first player ever to rush for 100 touchdowns and is still the only rusher in NFL history to average more than 100 yards per game for his career. He also had a successful acting career after he retired and was inducted into the Pro Football Hall of Fame in 1971. Faulk began his career with the Indianapolis Colts, but is known more for his time in St. Louis as part of “The Greatest Show on Turf.” In his first year with the Rams in 1999, he was a dual-threat as a rusher and receiver, totaling a then-record 2,429 yards from scrimmage, and helping lead the team to a Super Bowl title. The following year, Faulk was named the NFL MVP. He was Offensive Player of the Year three straight times from 1999-2001. Faulk is also the only player in NFL history to total 12,000 rushing yards and 6,000 receiving yards for his career. In 2011, Faulk’s first year of eligibility, he was elected into the Pro Football Hall of Fame. He’s currently an analyst for NFL Network. James was known as one of the top running backs in the NFL in the early 2000s. 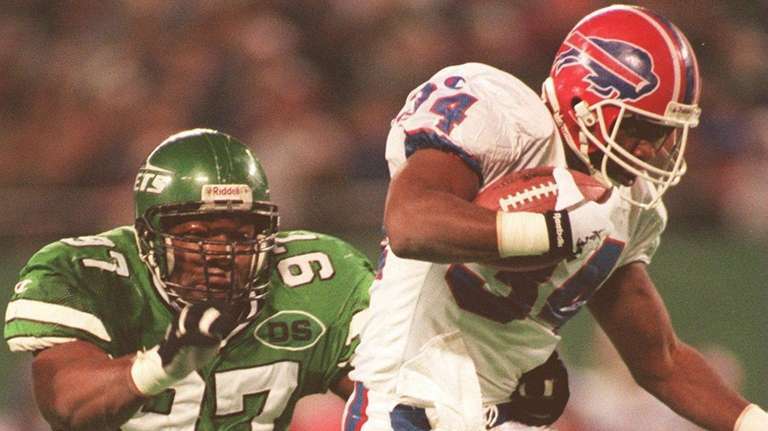 He was named the Offensive Rookie of the Year in 1999 and won the rushing title in his first two seasons. He suffered a torn ACL midway through the 2001 season, but was able to bounce back a few years later, rushing for more than 1,500 yards in 2004 and 2005. After leaving the Colts in 2005 as their all-time leading rusher, he had disappointing stints with the Arizona Cardinals and Seattle Seahawks, and is currently a free agent. Allen had one of the most spectacular seasons in NCAA history in 1981 when he ran for 2,342 yards at USC, becoming the first player ever to rush for 2,000 yards in one year. The following season, he led the Los Angeles Raiders to an AFC-best 8-1 record and won Offensive Rookie of the Year in a strike-shortened season. Allen may be best-remembered for his performance in Super Bowl XVIII, when he ran for 191 yards and two touchdowns. In 1985, he led the Raiders to a 12-4 record and was named NFL MVP. After he left Los Angeles, he had a successful stint with the Kansas City Chiefs before retiring in 1997. He was inducted into the Pro Football Hall of Fame in 2003, and is one of four players to win both the Heisman Trophy and Super Bowl MVP. Harris is remembered for his role in one of professional football’s most famous plays, “The Immaculate Reception.” He was selected to nine consecutive Pro Bowls from 1972-80 and helped lead the Steelers to four Super Bowl titles in the 1970s. Many people criticized Harris’ tendency to run out of bounds instead of taking on tacklers for extra yards, but Harris has responded by saying he extended his career by avoiding contact. He spent one year with the Seattle Seahawks before retiring in 1984 and he was elected into the Pro Football Hall of Fame in 1990. Thomas was a part of the offense that led the Buffalo Bills to four straight Super Bowl appearances, though he only performed well in one of those games and the team never won the championship. He won the NFL MVP award in 1991 and was elected to five straight Pro Bowls from 1989-1993. Thomas is the only player in NFL history to lead the league in total yards from scrimmage for four consecutive seasons. 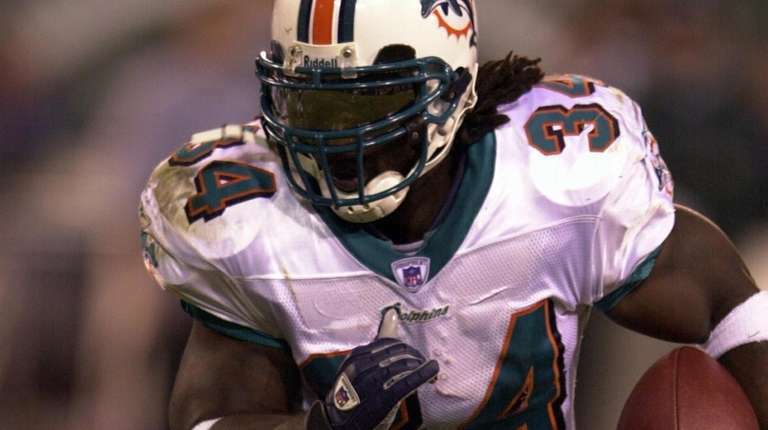 He spent one season with the Miami Dolphins before a knee injury forced him to retire in 2000. He was inducted into the Pro Football Hall of Fame in 2007 in his second year of eligibility. Despite injuries hampering him for the early part of his career, Taylor was still able to top the 10,000-yard mark in his 10th season. When he was healthy, he was great, rushing for more than 1,200 yards five times. He spent most of his career with the Jacksonville Jaguars before joining the New England Patriots in 2009, where he currently plays. Jackson had eight consecutive 1,000-yard seasons in with the Rams before moving to Atlanta for his final two seasons to break into the 10,000-yard club. The Patriots signed Jackson for the final two games of the 2015 NFL season. Nicknamed “The Diesel,” Riggins was known for his powerful running-style. He began his career with the Jets before joining the Washington Redskins in 1976. He helped lead the team to a Super Bowl title in 1983 and was named MVP of the game. Riggins was still good late in his career and still holds multiple records for being the oldest player to reach single-season rushing achievements, including oldest player to score more than 20 touchdowns in a season and oldest player to amass more than 1,300 yards in a season. He was inducted into the Pro Football Hall of Fame in 1992. Dillon spent the early part of his career with the Cincinnati Bengals where he was one of the few bright spots on an otherwise bad team. He rushed for more than 1,000 yards every year from 1997-2002. Dillon left the team as the all-time leading rusher in 2004 and joined the New England Patriots. In his first year in New England, he set career highs and franchise records with 1,635 rushing yards and 12 touchdowns and was an integral part in the team’s Super Bowl run. 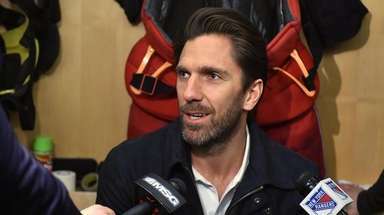 He retired in 2007. Known more for his off-field troubles than his on-field heroics, “The Juice” was one of the most exciting players of his generation. Simpson was the first player in NFL history to rush for more than 2,000 yards, a feat he accomplished in a 14-game season. He spent most his career with the Buffalo Bills before being traded to the San Francisco 49ers, where he played two seasons. He also had a successful acting career both before and after he retired. He was inducted into the Pro Football Hall of Fame in 1985. Dunn began his career with the Tampa Bay Buccaneers and was named Offensive Rookie of the Year. 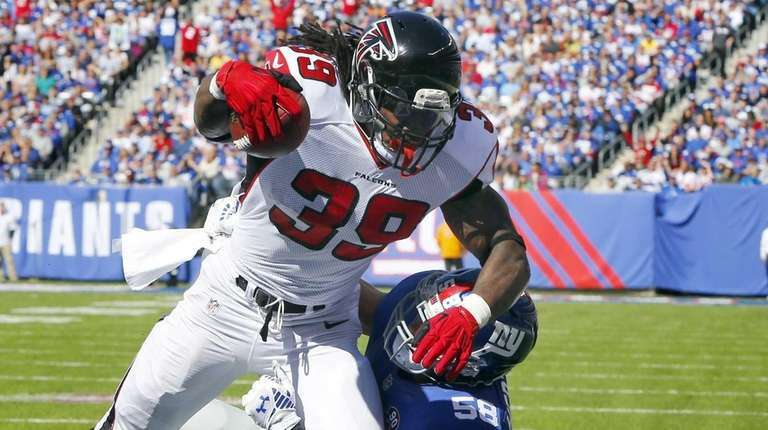 He joined the Atlanta Falcons in 2002 and led the team with 1,106 rushing yards in 2004. A three-time Pro Bowl selection, Dunn was one of the most durable running backs of his time, missing only 10 games during his career. He is currently a minority owner of the Falcons. Ricky “Running” Watters played for 10 seasons in the NFL with San Francisco, Philadelphia and Seattle. The 49ers’ offense led the league in scoring and yardage each year Watters was their starting running back. In 1994, he set a postseason record with five rushing touchdowns in San Francisco’s win over the Giants in the divisional round. That same year, Watters scored three touchdowns in their 49-26 Super Bowl victory over the San Diego Chargers. Lewis was drafted by the Baltimore Ravens and immediately made an impact in his rookie season. He rushed for more than 1,300 yards and helped lead Baltimore to a Super Bowl title, becoming only the second rookie ever to rush for more than 100 yards in a Super Bowl. In 2003, Lewis led the league with 2,066 rushing yards, falling 39 yards short of tying Eric Dickerson’s single-season rushing record. He also ran for a then-single game record 295 yards on his way to being named Offensive Player of the Year. Lewis also played for the Cleveland Browns before retiring in 2009. 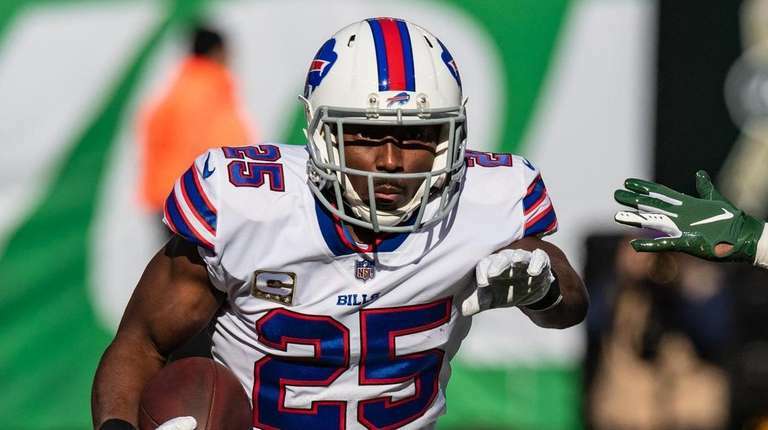 McCoy has rushed for at least 1,000 yards in all but three of his NFL seasons. He eclipsed the 10,000-yard mark in the Buffalo Bills' 24-6 win over the Miami Dolphins on Dec. 17, 2017. 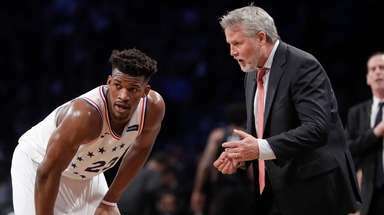 Jones is known mainly for his time with the Chicago Bears and the Jets. In 2006, he ran for 1,210 yards and helped lead the Bears to a Super Bowl appearance. 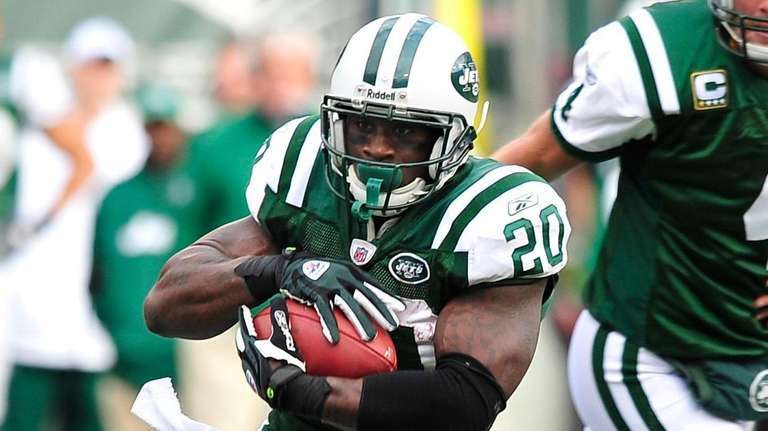 He was traded to the Jets in 2007, and had career years in 2008 (1,312 yards, 13 TDs) and 2009 (1,402 yards, 14 TDs). 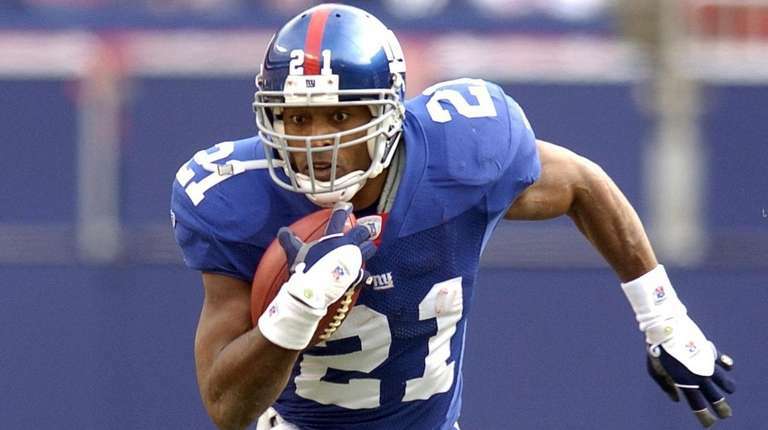 Barber spent his entire career with the Giants and retired as their all-time rushing and reception leader. He was known for his exceptional cutback ability, quick feet and running vision — and a fumbling problem he corrected toward the end of his career. Barber retired in 2006 to pursue a broadcasting career. On March 8, 2011, he filed papers to come out of retirement. Although the Giants still retain the rights to Barber, they said they plan on releasing him once the collective bargaining agreement is reached. After a very successful college career at Ohio State that included a Heisman Trophy, George won the Offensive Rookie of the Year award in 1996 and was the Houston Oilers and Tennessee Titans starting running back through 2003. He never missed a start due to injury, becoming just the second player, along with Jim Brown, to rush for 10,000 yards without missing a start. His 128 consecutive starts is second only to Walter Payton for running backs. He spent one year with the Dallas Cowboys before retiring in 2004. Lynch has rushed for at least 1,000 yards in a season six times, including four straight with the Seattle Seahawks from 2011-14. Lynch missed nine games in the 2015 season after undergoing surgery to repair a sports hernia and announced his retirement after the season. But Beast Mode came out of retirement in 2017 with the Oakland Raiders. In the final game of the season, Lynch rushed for 101 yards to surpass 10,000 career rushing yards in a 30-10 loss to the San Diego Chargers. Anderson began his career with the St. Louis Cardinals and ran for 1,605 yards his rookie season. He topped the 1,000-yard mark in five of his first six NFL seasons. Injuries forced him into becoming a short-yardage and goal-line option before his career saw a resurgence with the Giants. He was named NFL Comeback Player of the Year in 1989 and Super Bowl MVP the following year. Williams rushed for more than 1,000 yards in a season five times. Williams missed several seasons because of early retirement and failed drug tests for marijuana, but he returned to eclipse the 10,000-yard mark with the Ravens in 2011. Williams' best year came with Miami in 2002 when he led the NFL with 1,853 rushing yards and scored 16 touchdowns.